Our church is blessed with people who care deeply about social issues and put that care into action as individuals, families and community groups. St. Luke's values the individual qualities, life experiences and perspectives of our members. The similarities of our outward appearances may, in fact, belie the diverse pathways we each travel in our service within the Parish and in our larger community. Our mission and outreach are the pathways by which we transform our hearts of worship into our hands of service. The parishioners of St. Luke's, as individuals, families and in concert with others, strive to serve our community through our leadership, labor and resources. We believe that every person has a role to play in creating a just, peaceful and honored world. St. Luke’s has a long history of going beyond our walls to identify and help address the challenges facing our neighbors and the larger community. We continue to seek deeper ways of putting our faith into action. While the diverse skills and interests of our members shape the type and focus of our outreach programs, much of our work has centered on those facing life challenges, such as a lack of adequate food. Within our home of Licking County, 36% of households earn less than the amount needed to provide for housing, child care, food, transportation and health care. Having an adequate amount of food is, for many, a daily challenge. Our members' commitment to addressing this situation takes many forms. St. Luke's founded and continues to be strong supporter and of the Licking County Food Pantry Network. This nonprofit agency supports dozens of food pantries and coordinates both the registration of clients and the purchase and distribution of foods for the pantries. Bulk and discounted food purchases maximize the amount of food which can be provided but without the donation of funds these purchasing opportunities are lost. 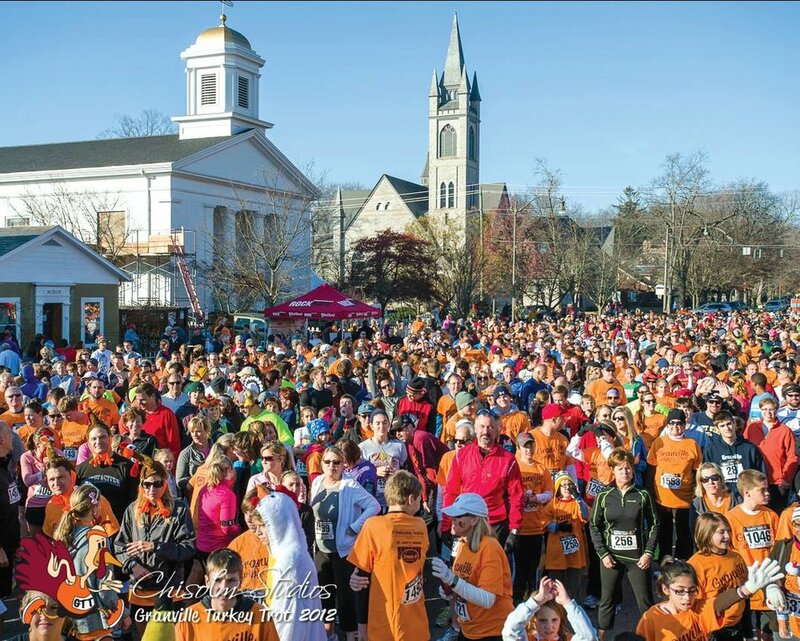 For thirteen years, on Thanksgiving morning, St. Luke's has sponsored the Granville Turkey Trot— a run/walk down the main street of Granville. Through registration fees paid by about 2,500 participants, corporate sponsorships, special events and the sale of every manner of event clothing (e.g. hats, scarves, and vests), the church and the community raise funds for the Food Pantry Network. Thanks to the dedicated work of many, in 2018 the Turkey Trot contributed $79,000, to bring our ongoing support for the Food Pantry through the Turkey Trot to almost $800,000. In 2012, through the Food Pantry Network, the Parish began exploring the possible need for additional food pantry sites. As a result, in 2013 St. Luke's opened the Market Street Pantry near the downtown area of one of our neighboring cities, Newark, Ohio. Volunteers from the Parish and other churches operate the Market Street Pantry two mornings each week. The multitude of tasks involved, such as working with the clients, stocking shelves, transporting supplies, and completing paperwork means there is work available for anyone who volunteers. A typical morning finds between 30 - 40 families benefitting from the market. The Turkey Trot and the Market Street Pantry are just two of the many programs supported by St. Luke's Outreach Committee, which provides grants to a number of different programs. Additionally, we prepare and serve meals to St. Vincent's Haven (a men's shelter) and our Wise Women group gathers personal hygiene products to distribute at the Market Street Pantry. Never static, our outreach programs evolve and continue to grow. We have just initiated two new programs – providing meal support at the Center for New Beginnings (a shelter for survivors of domestic violence) and exploring our role in Bishop Curry's initiative, Becoming Beloved Community. Consistent with the Parish’s history, we continue to seek new and deeper ways of acting out our faith. St Luke's parishioners believe that pastoral care is most effective as a ministry when it is shared among the Rector, the staff and the parishioners. Our care ministries are a source of support and comfort that nurture the well-being of the parishioners and complement and amplify the care provided by the clergy. When a member of our Parish faces changes, challenges, or particular difficulties, we strive to be a source of compassion, support and love. Prayer: We remember in prayer those in need. This is done in several ways, including in our regular Sunday services, through our prayer list, and in our prayer card ministry. Eucharistic Visitors: Specially trained and registered laity go in teams of two to take communion to home-bound parishioners. Communion also is shared in a small group for some of our members who are living in a local retirement community. Friendly Visitors: Laity go through training, including Safe Church Training, to visit parishioners who cannot attend our Sunday services. These visitors provide an ongoing connection between the church and those who are at home or in care facilities and offer encouragement and support. Prayer Shawl Ministry: Both novice and experienced knitters, crocheters and others who enjoy the needle arts, meet on a monthly basis to handcraft prayer shawls. The shawls are blessed and offered as a source of comfort and caring. They serve as tangible reminders of prayers prayed and love shared. Kendal Services: One Sunday each month our Rector and parishioners provide a service in the meeting room at Kendal, a local community retirement center. All Kendal residents are invited to attend, and laity often participate by providing music, reading scripture and offering a warm welcome. Denison University: St. Luke's church has a close relationship with Denison University. Many of our members are graduates and/or current and former faculty and staff at Denison. Through the Canterbury Club, the Rector and students meet weekly to reflect on the issues that are most important to the students. St. Luke's also offers a Choral Scholars program in which university students receive a stipend and share their talents as members of our choir. With the assistance of the University Chaplain & Director of Religious and Spiritual Life, who is a St. Luke's member, we continue to explore additional ways in which we can expand our support of the university students. Health and Wellness Ministries: St. Luke's continues to explore ways to support the health and wellness of our family members. Our programs have included a health fair, a parish bike ride, exploring end-of-life care, and an annual Solstice service for those dealing with loss during the holiday season.